After proving herself a competent director in her debut film, The Virgin Suicides, Sofia Coppola returns with a much more mature and far more accomplished sophomore effort that suggests she is well on her way to surpassing her father, certainly in his more recent offerings. In stunning film of subtle simplicity she weaves a fragile and poignant friendship over a touchingly funny Tokyo background. Lost in Translation is the tale of a chance collision between two souls feeling trapped in their lives and lost in a foreign world. 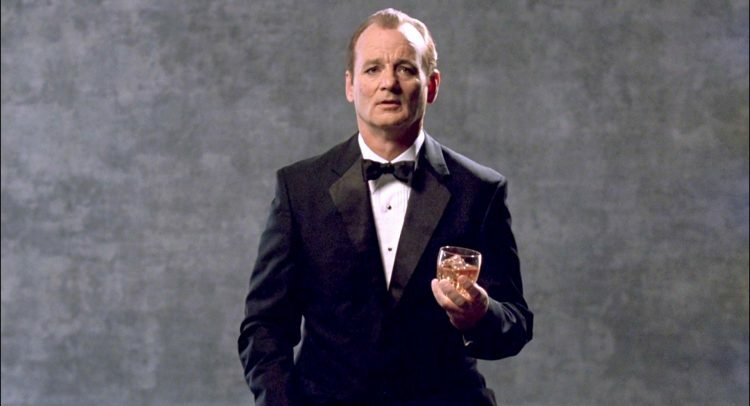 Actor Bob Harris [Bill Murray] is endorsing a whiskey purely for the money although he enjoys the break from his wife, while Charlotte [Scarlett Johansson] is accompanying her neglecting husband John [Giovanni Ribisi], a photographer. 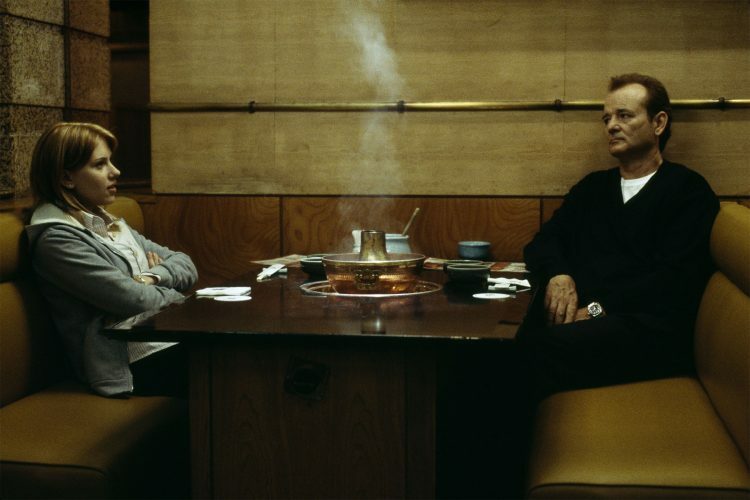 Set against a delightfully colourful backdrop of Tokyo which provides much of the film’s comedy, we watch the friendship between these two strangers slowly blossom into a delicate platonic romance. While there is a distinctly melancholy tone to the film, it is not nearly as dark as The Virgin Suicides and instead portrays the redemption of its characters rather than their doom. Bob and Charlotte are drawn together by a sense of depression, both somewhat discontent with married life, disconnected from their partners, and feeling extremely lost in both Tokyo and in life. But these shared circumstances lead them to engage in those metaphysical conversations that can only occur between total strangers, since friends always wish to know the personal background. When asked by his wife, “Do I need to worry about you, Bob?” his flat response is, “Only if you want to”. While in Charlotte he has found someone who will genuinely listen and also seeks to learn from his experience. The stage is set for a perfect throwaway Hollywood romance, but the key to this film is that it never caters to what its audience expects and sometimes desires. The result is that some will find it frustrating to watch and without suitable conclusion. In fact, there is not even so much a plot as a series of carefully captured connections between the two leads and their separate journeys of self-discovery, making the affair more of a character-study. Combine this with an intentionally slow pacing, and the result is poetic work of rare beauty that will be difficult to appreciate for those who stick solely to traditional Hollywood fare. Both leads turn in outstanding performances. Those who suggest this is Murray’s definitive role are sometimes criticised on the basis that this is simply the same role he always plays. The key here is his handling in subtly underplaying the dialogue he is offered, most clearly visible in the karaoke scene where it would have been all to easy to go all out, but instead he remains perfectly in Bob Harris’ reserved character throughout. Johansson’s acting is brilliantly captured by Coppola, who seizes the smallest smile or subtlest inflexion of her voice and turns it into something both moving and beautiful. And it is such detail in its simplicity and lyrical beauty that raises this film far beyond most others, one such example being a scene with no dialogue where the camera pans slowly around Johansson sitting on the windowsill of her hotel room from where we see the sprawling vastness of Tokyo and Charlotte’s confusion, displacement and sense of drifting without a word being uttered. Such moments are amalgamated with soft-focus close-ups, simple orchestral scoring and a lingering camera to hold a shiver-inducing ethereal quality. Much of the film’s humour comes from the culture-clash element we are shown as especially Harris stumbles through his job. The unsubtitled photo sessions allow us to share in his alienation, and while the film does sometimes softly poke fun at elements of oriental culture, it equally shows off the grandeur of Tokyo as a bustling and unparalleled urban metropolis. Murray’s deadpan, “Am I drinking? As soon as I’m done…” and dour expression in numerous awkward situations are a mixture of genuinely laugh-out-loud funny and touchingly tender. The nature of the relationship between Charlotte and Harris is impossible to define but it is that quality which again raises this film above more standard romantic comedies with their clumsy manipulation of audience emotion in all-too-obvious tearjerking attempts. Here we are offered a rare glimpse in Coppola’s very honest and pure depiction of this blossoming friendship which struggles in its fragility but is ultimately a positive experience. There are some strange quirks to the film, such as the number of shots of Scarlett Johansson in revealing underwear. Of course, being a female director Sofia Coppola is able to get away with such things, but nevertheless it does eventually feel a little unnecessary unless it is intended to demonstrate vulnerability in her youthful beauty. Some of these quirks are wonderful however, such as the closing scene when Bob whispers into Charlotte’s ear and we are unable to hear what is said. Yet it feels right that we are denied this, for it makes that momentary connection between them infinitely more intimate and we are instead left with an exhilarating curiosity as to just what it is he said that made her smile in that bittersweet instant. Coppola has risen leaps and bounds with this incredible second film, a film that works through visual poetry where silence can speak volumes, an intensity in its characters and location, and its incredibly honest subtlety in the interaction between its characters. In its closing, just as in life, the leads don’t solve all their problems and yet, because of all they have shared, they feel a little better anyway, and in that profoundly bittersweet melancholia that runs throughout the film, so too should the audience.